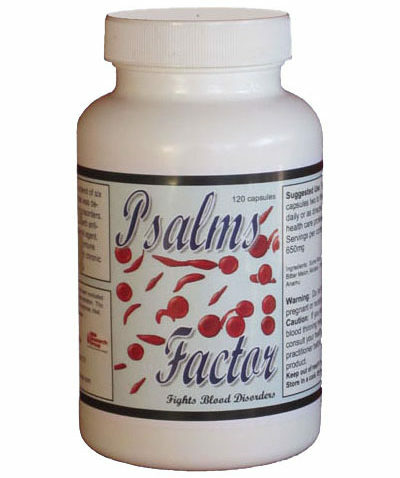 Psalms Factor is a blend of six rain forest herbs that was designed to fight blood disorders. This product is a superb anti-viral and anti-bacterial agent. Also stimulates the immune system and helps with chronic fatigue and low libido. Listed below are the herbal ingredients and their reported health benefits. * fights sickle cell, reduces inflamation, relieves pain, inhibits cancer, inhances immunity, increases indurance. * for hormonal disorders (menopause, PMS,ect.) for chronic fatigue. * for viral infections (HIV, herpes, Epstein-Barr, hepatitis, & influenza). *for bacterial infections (staphylococcus, streptococcus, & salmonella).as a bitter digestive aid. * for skin diseases (dermatitis, psoriasis, skin infections, rosacea, & scleroderma). for viral infections. * for kidney stones and gallstones. for viruses, hepatitis A, B, & C, herpes & HIV. and increase urination. for hypertention and high cholesterol levels.